Collins Booksellers - Computational Economic Analysis for Engineering and Industry by Badiru, Adedeji B., 9781420007589. Buy this book online. Recent global anxiety indicates that more focus needs to be directed at economic issues related to industry. Conventional techniques often do not adequately embrace the integrated global factors that affect unique industries and industry focused computational tools have not been readily available. Until now. 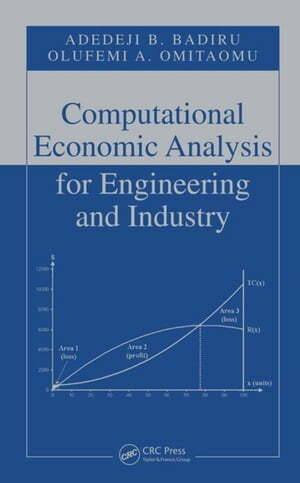 Computational Economic Analysis for Engineering and Industry presents direct computational tools, techniques, models, and approaches for economic analysis with a specific focus on industrial and engineering processes. The authors supply downloadable software, ENGINEA, that allows you to easily perform the various techniques outlined in the text, such as investment justification, breakeven analysis, and replacement analysis. Providing a high-level presentation of economic analysis of the unique aspects of industrial processes, they integrate mathematical models, optimization, computer analysis, and managerial decision processes. A comprehensive treatment of economic analysis considering the specific needs of industry, the book is a pragmatic alternative to conventional economic analysis books.